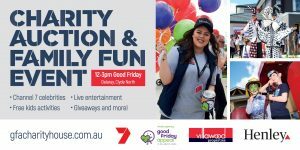 Good Friday Appeal - Charity Home Auction & Street Party! Join us as we celebrate the Good Friday Appeal at Delaray! On 19 April, Villawood and Henley Homes will be auctioning off a gorgeous brand new home at Delaray, with every cent from the sale going to the Royal Children’s Hospital’s Good Friday Appeal. The surrounding street party will kick off at 12pm and is sure to get everyone buzzing ahead of the auction at 2pm. Domingo Avenue, Clyde North, will be the scene of a spectacular street party as the local community comes together to support the Good Friday Appeal. The free family-friendly event will enthral kids of all ages with rides and bouncing inflatables, face painting and roaming performers. There will also be live acoustic performances and a very special appearance by Stewie Koala, Locky Cocky, Spike Echidna, Ellie Emu and the rest of the Animals of the Magical Mountains crew! All this, plus the mouthwatering BBQ and free coffee for the grown-ups, is thanks to the outpouring of support from local entertainers and suppliers. Visit our event page for more information about this free event for the whole family!